Wilma Flintstone, the beloved flame-haired matriarch of the iconic Flintstone family, has been a television staple since her introduction, more than half a century ago. From her 1960 debut to the present, generations of kids have watched Wilma interact with her family and the world, learning valuable lessons as they go. 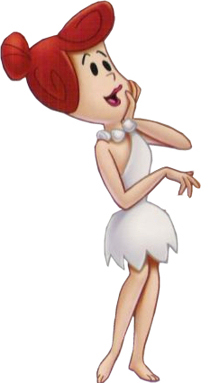 Here are ten of the most important things children learn from Wilma Flintstone. Someone Has to Keep a Level Head – When Fred’s antics are particularly problematic, Wilma is portrayed as a level-headed, clear-thinking woman capable of damage control. Handling these situations with relative ease helps kids understand that approaching a problem calmly is the best method. Volunteering is a Great Hobby – Wilma Flintstone often volunteers with charitable organizations and works with women’s groups in her town; this socially-conscious behavior sets a powerful example for kids, teaching them that civic responsibility is an important part of being a citizen. Capitalize On Your Talents – One of Wilma’s many talents is cooking; she used this skill to her advantage in one episode by selling her legendary gravelberry pie to the supermarket chain Safestone. The ability to capitalize on her skills in a way that benefited everyone involved is another example of Wilma being a great role model. Patience is a Virtue – Living with and tolerating the antics of Fred Flintstone requires an impressive store of patience, which Wilma seems to have in spades. Seeing such patience in action is a great way for kids to understand the positive impact it can have. Domestic Abuse is Very Wrong – The very earliest episodes of the Flintstones portrayed a very different aspect of Wilma: a domestic abuser. She and her friend Betty Rubble pummeled and berated their husbands; this behavior was later toned down, showing kids that even animated domestic violence is wrong. We All Have Our Flaws – While she’s often painted as the more practical of the couple, Wilma has her own set of character flaws; primarily, her penchant for overspending. This negative aspect of her personality shows kids that absolutely no one is perfect, and that making an effort to curb destructive impulses is imperative. A Good Friend is Great to Have – Just as Fred has Barney to keep him company during his various schemes, Wilma has a great sidekick in Barney’s wife Betty. The solidity of these friendships is a great example of how important being a good friend is. Knowing Who You Are is Important – Due to a continuity error on the part of writers, Wilma’s maiden name is shrouded in mystery. Early episodes clearly state that her name was Wilma Pebble, while later ones have claimed that she was called Wilma Slaghoople. Though the former has fallen into canon, it’s still a funny lesson about attention to detail. Being a Peacemaker is a Valuable Skill – One of Wilma’s strongest attributes is her ability to diffuse potentially messy situations. Seeing chaos averted by Wilma’s ability to keep the peace can help kids understand the importance of avoiding conflict. Jealousy Can Cause Problems – Another of Wilma’s character flaws is a tendency to become very jealous when Fred interact with other women. This unflattering behavior serves as a great example for kids about keeping envious tendencies in check. Another of the great cartoon characters that have entertained several generations of children, Wilma has, and continues to, teach many lessons through her prehistoric life lived out on the television screen.